The accompanying CD offers an audio version of the story and a rich variety of original songs that complement Duffy’s story, reinforcing the message of hope and courage. The CD may be used for children who are not old enough to read, developmentally disabled or whose injuries have interfered with their ability to read. The upbeat music offers a close reflection of the themes of the story, enabling children to recall messages they took from the story in a comforting and enjoyable way. 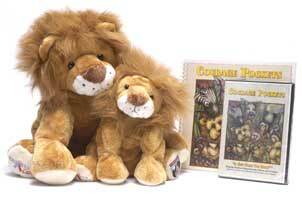 Through the Courage Lion, “Courage Pockets”, and accompanying CD, music and storytelling can combine with imagination to help transform a child’s hospital bed into a much more comfortable and healing space.